Latest photo of Puntung shows how large the carcinoma has become. KOTA KINABALU: Puntung, one of the last three Sumatran rhinos in Malaysia, is dying of squamous cell cancer. Sabah Wildlife Department director Augustine Tuuga, in sharing the sad news with the media today said Puntung can no longer breathe through her left nostril, can no longer vocalise, is in pain and her condition is declining fast. Other than administering painkillers, there is nothing more anyone can do. “We are left with no other recourse except to agree with professional medical advice and accordingly we have authorised euthanasia. This was a very difficult decision to make, but the specialists agree that this is the best out of a very small number of unpleasant choices,” he said. Augustine added that they plan to conduct the euthanasia procedure on June 15. Puntung attracted global attention in April 2017 through dental surgery performed by a multinational team in Tabin Wildlife Reserve. The surgery was conducted by Thai veterinary dentist Dr Tum Chinkangsadarn and the State Wildlife Department where two molar teeth and one premolar were extracted from Puntung’s left upper jaw. Puntung had been suffering since mid March from an abscess inside her upper jaw that would not heal despite treatment. “It turns out that the swelling on Puntung’s left cheek that alerted us to the infected tooth root had a more serious origin. After the surgery, the swelling progressed, and two subsequent biopsies revealed squamous cell carcinoma,” Augustine disclosed. According to him the cancer has been spreading rapidly over the past few weeks and specialists from several countries concur that it will be fatal, with or without treatment. This is devastating news for all of those who have been involved in Puntung’s life over the past ten years, from those in SOS Rhino who monitored her in the wild in the Tabin forests since 2007, those who captured her in 2011, to those who cared for her daily and still care for her right up to now.,” said Dr John Payne, executive director of Borneo Rhino Alliance (Bora). “We thank the many people, both in Malaysia and overseas, who heartened us with their good wishes in April and financial support for the dental surgery and follow-up work. 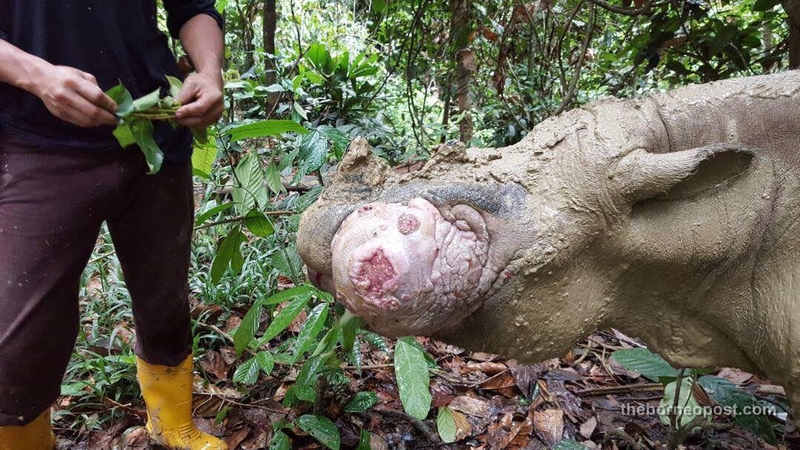 “We would like to record our profound thanks to Sime Darby Foundation, which not only covered the costs of monitoring, capture, translocation and care of Puntung since 2009, but whose council members and officers have maintained a constant personal interest in her welfare and progress,” he said. Bora staff who have had Puntung under intensive care over the past two months have been shocked by the very visible rapid growth in the size of the carcinoma. He said that Bora has kept in close touch with experts in Europe, South Africa and Thailand, and there is no doubt in our minds that any form of conventional treatment would just prolong her agony. “We are also making preparations to try to recover eggs or oocytes from Puntung. With that, she may yet be able to contribute to the survival of her species,” Dr Payne said.